December | 2012 | Small Farmers. Big Change. 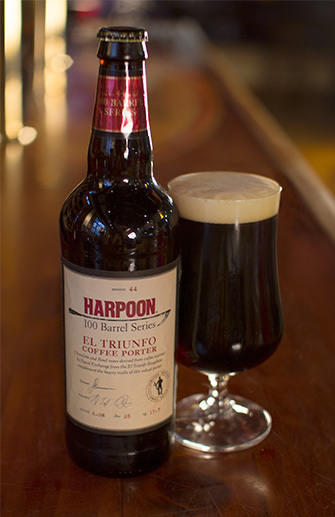 When the chance to work on a brew with Harpoon came along, we at Equal Exchange jumped at it. Collaborate with another elite company rooted in New England, about the same size, established in the exact same year? YES, PLEASE! As work started on this edition of the 100 Barrel Series, we knew we had made the right decision. It was interesting, engaging and a blast to get to know the people of Harpoon and to make such an amazing tasting coffee porter. Read more here. Lately the Democratic Republic of the Congo (aka DRC) has been in the news again, but for the worst reasons. The feared M23 rebel group is on the march in the eastern part of that vast nation. On November 20th they captured the city of Goma, and announced their intent to capture more cities. Meanwhile tens of thousands of Congolese ─ people already displaced by earlier violence ─ have had to flee their refugee camps as the rebels approached. In all about 500,000 people are displaced within the country. A powerful piece this Sunday in the New York Times, “The Worst War” explains in broad strokes what has been going on, and going wrong, in the region and how the DRC came to be this way. 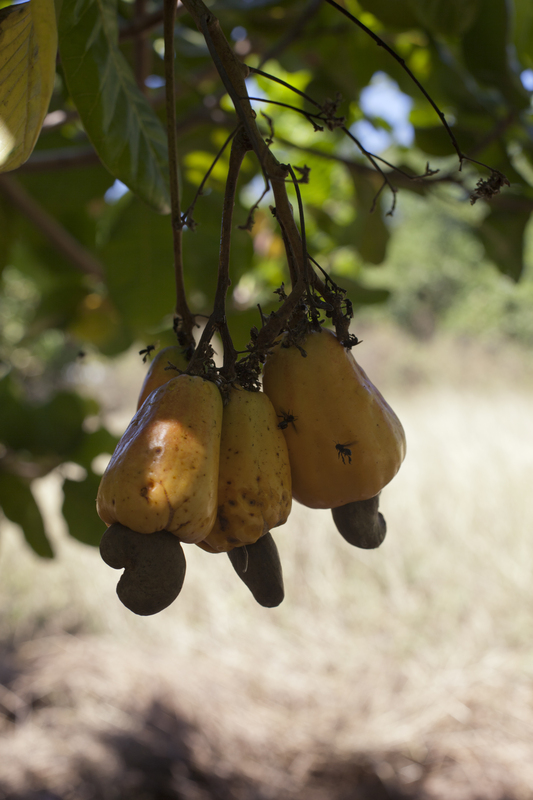 Cashew fruit smells and tastes sweet, almost like an apple, but can also be slightly astringent. It bruises easily so isn’t often sold whole, but rather is made into a delicious fruit juice. Today in San Nicholas Lempa, Department of Usulutan, El Salvador, the staff of Aprainores, a 55-member cashew nut co-operative, is loading up approximately 12,000 pounds of cashew nuts and driving them to the port in Acajutla. They will leave El Salvador this Saturday and arrive at the Equal Exchange warehouse in Portland, Oregon sometime in mid-January. 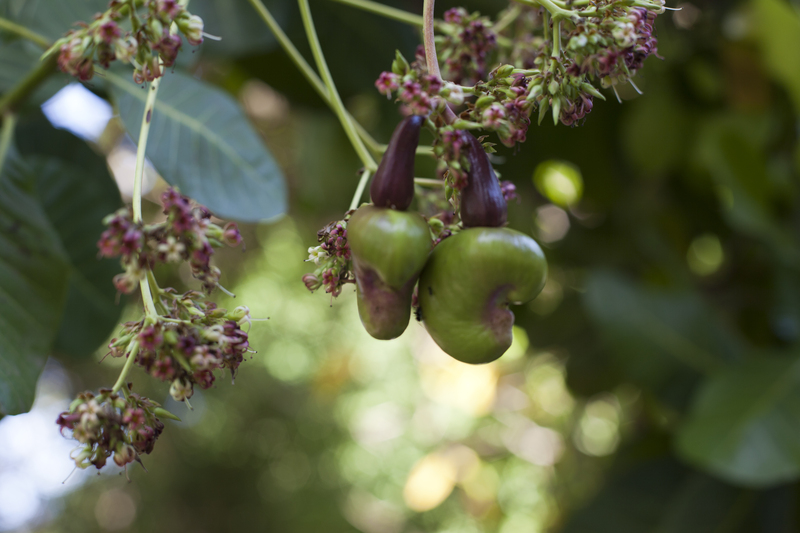 Soon after that, the cashews will be sold in natural food stores across the United States. Think about it… this holiday season many of us will be snacking on nuts and dried fruits. How much do we know about where they are from, who grows them, and under what conditions? Regardless of whether we make our purchases in a supermarket, Whole Foods, Trader Joes, or a natural food store, chances are we are not given very much information about the products’ origin. 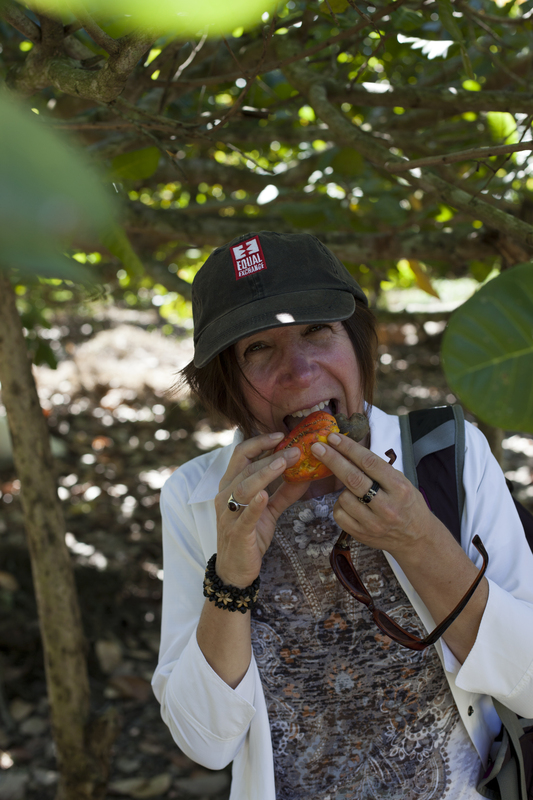 Thankfully, many consumers are now interested in knowing the story behind the coffee, tea, chocolate, and produce which they purchase. We think it’s high time that this same information be made available about nuts and dried fruits so that consumers have both information and choices. 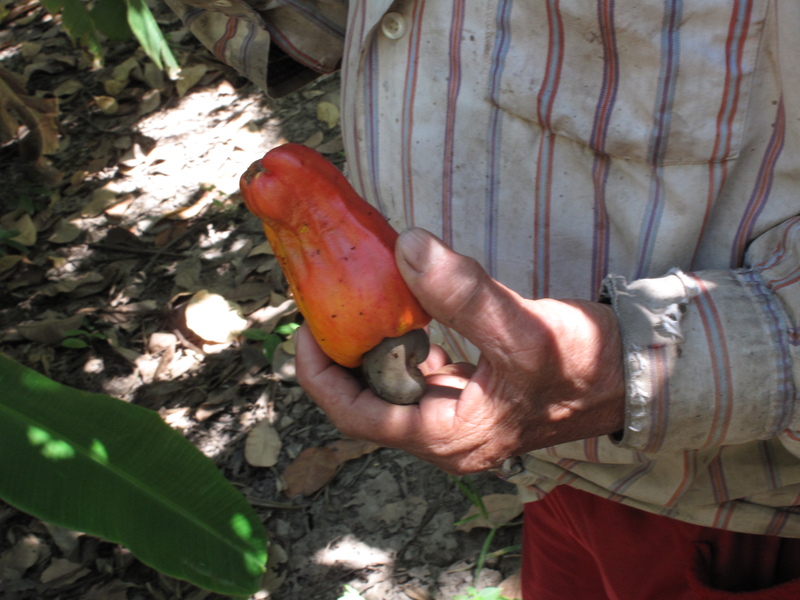 We are also excited to give the same level of attention; and respect; to the farmers who produce them. 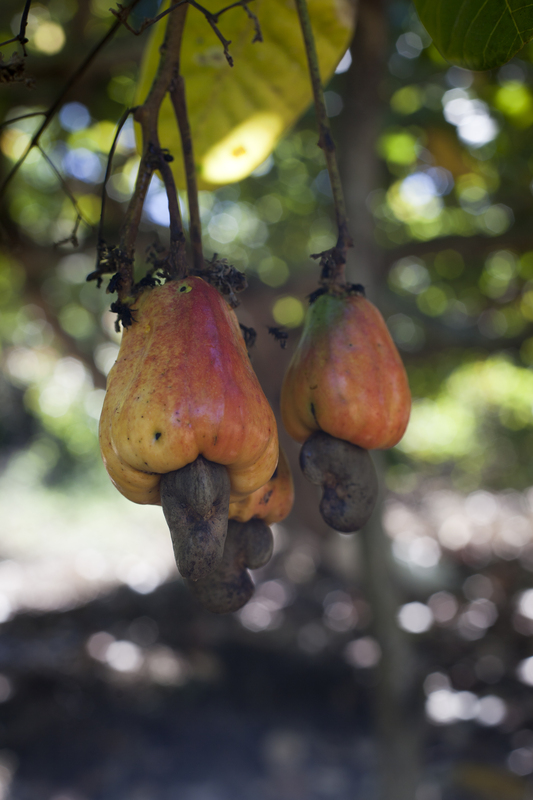 There’s much to share, but it occurred to me that many people have never seen a cashew nut fruit or a cashew nut tree. So today’s blog post starts with the basics. 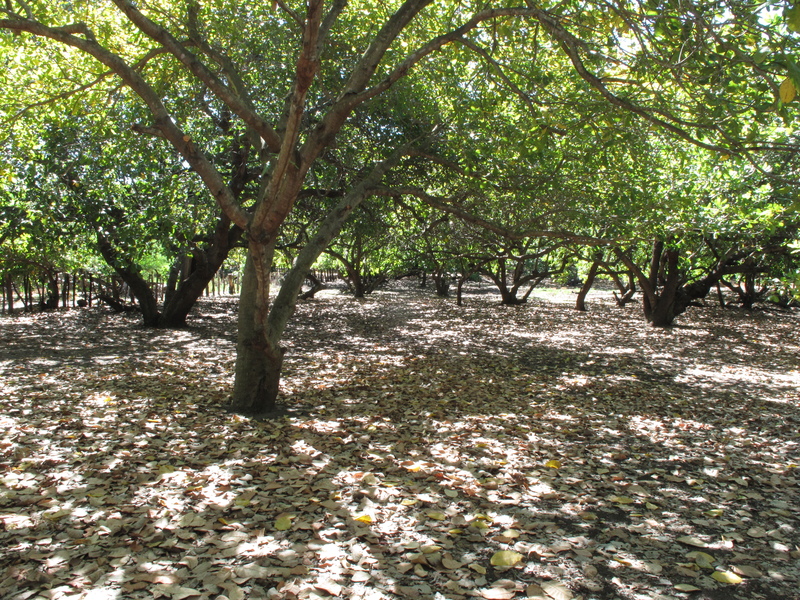 Cashew nut tree farms on the Isle of Montecristo where 15 members of Aprainores live. The trees are 80 – 100 years old. 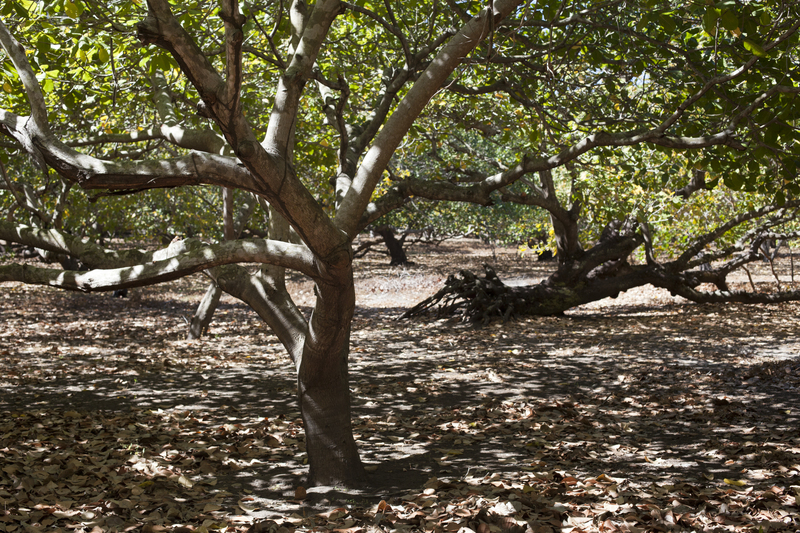 These trees were all planted by a german landowner, Luz Draico, who owned the island, a neighboring island, Tasajera, and what is now two communities on the mainland, La Canoa and El Naranjo. The harvest typically begins in late December. First, little purple flowers bloom. About a week later, the nut appears. Next, what appears to be a brown stem, is actually the fruit beginning to grow. 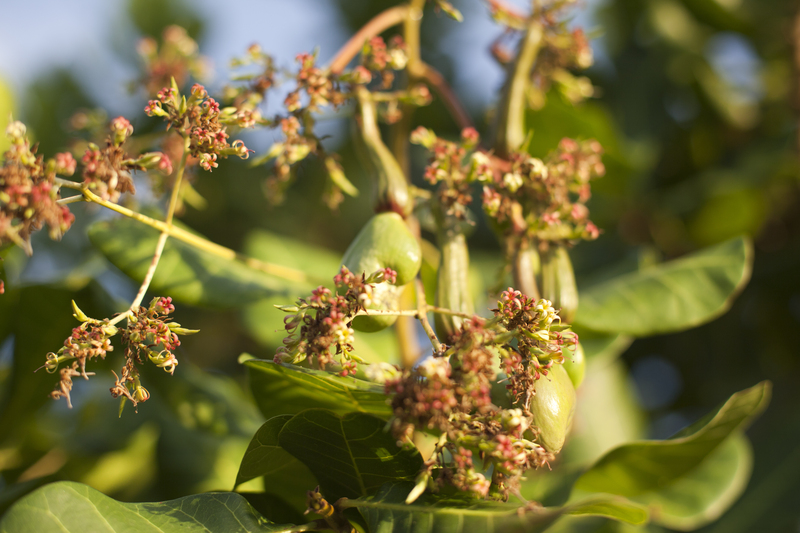 The fruit ripens approximately six weeks after the flowers come out. Cashew fruit can by yellow or red. Once ripe, the fruit falls to the ground. (It’s very important not to pick the fruit off the tree or it will damage the following year’s harvest.) 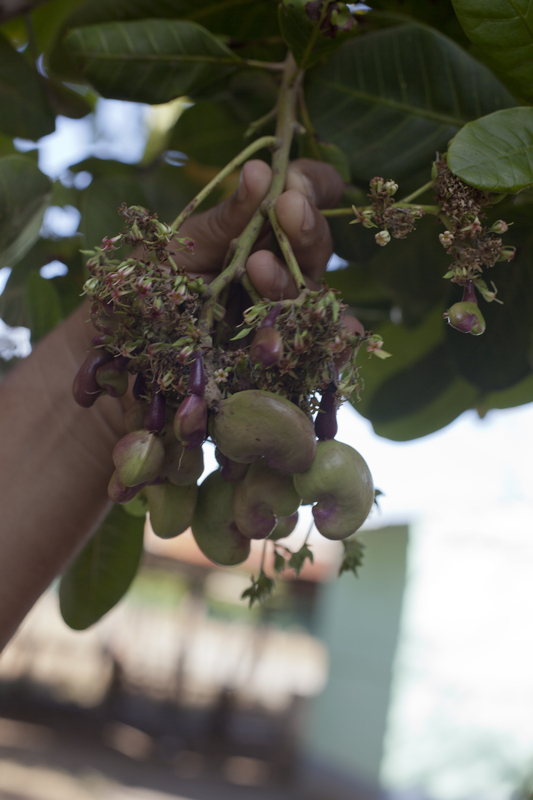 The farmers pick the fruit up off the ground, remove the cashew nuts and bring them back to their houses where they dry them in the sun for three days before sending them in motor boats to Aprainores for further processing. The farmers keep the fruit to make a refreshing drink for their own consumption. 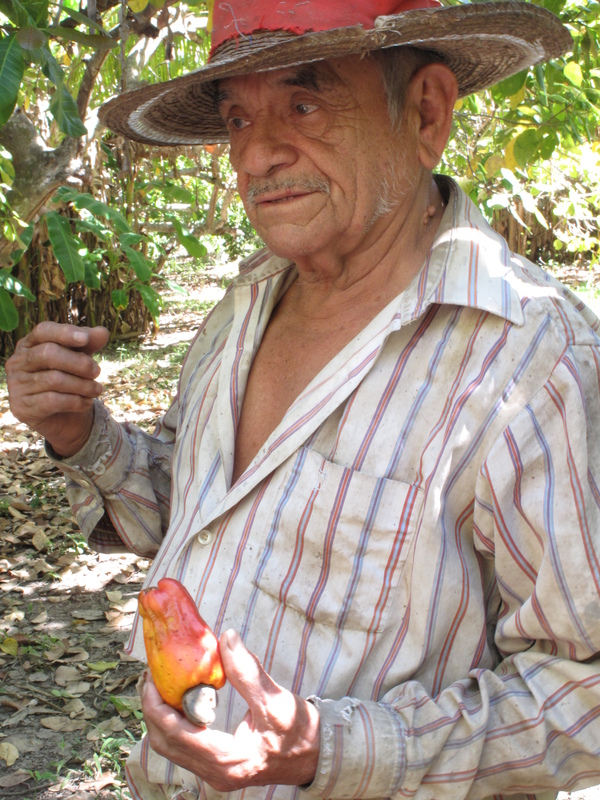 Leopoldo Rafael Abrego, on his farm in El Naranjo. When I first starting working with Dan and Addie at Real Pickles four years ago, I was impressed by their delicious fermented vegetables and commitment to family farms here in the Pioneer Valley. I was also intrigued by how they thoughtfully rejected the conventional wisdom that success for a natural foods business means getting national distribution, scaling up and selling out. What kind of organic food business would limit sales to the northeastern US when there was clear demand across the country? Who would decline sales to big food distributors in favor of local companies and direct deliveries? This approach has been very successful for Real Pickles over the past eleven years. And these unconventional ideas about how to run a business are not just ideological. They are sound decisions for owners whose concern is not maximizing profit, but creating a stable business that contributes to a vibrant regional, organic, and values-based food system. Based on these priorities, Dan and Addie have decided that the best path for them is to convert their business to a co-op. As member-owned enterprises, cooperatives are designed to meet human needs and aspirations before maximizing profit. Because of this, co-ops tend to focus on long-term goals beyond the quarterly balance sheet. Dating back to the 1800s, the cooperative movement offers a democratic economic alternative that roots wealth in local communities. When the United Nations declared 2012 the International Year of Co-ops, the goal was to shine a light on a business model that now includes over a billion members worldwide – more people than directly own stock in publicly traded corporations. For me personally, Real Pickles’ transition to a co-op is an exciting opportunity. Before joining the business, I spent a decade as a member of Equal Exchange, a Fair Trade Organization committed to working with small farmer co-ops throughout the world. Through this work, I was able to see how cooperatives enable people to change their lives and communities — often in the context of geographical isolation, governmental neglect and poverty — and meet their needs, together.